I just finished listening to this excellent lecture by Dr. Paul Vitz, a professor of psychology at NYU, and author of Faith of the Fatherless. In it, he explores the psychological reasons for unbelief. there is a very strong correlation between unbelief and the breakdown of the family authority structure, the safety of the family, and esp. the experience of a failed father. He proposes that this is also a causative factor as well. His lecture contains some other VERY interesting perspectives, including a Freudian analysis of unbelief – that of an unresolved Oedipal complex. Not that he believes this, but that, if one did, that is how Freudian psychology might explain unbelief. Summary of his interesting points below. He begins by covering Sigmund Freud and William James, who studied belief as the result of natural causes (psychological). He discusses how this foundation set psychology off in an antagonistic, skeptical stance towards faith, esp. the Christian faith, which Freud despised. He discusses how using psychology to examine UNbelief, which characterizes the majority of secular psychologists, alarms them. I’m sure he’s right. 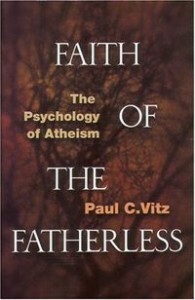 But Vitz argues that psychoanalatic tools can be used to study belief and unbelief alike. a. The major barriers to belief in God are not rational, but psychological. I am quite convinced that for every person strongly swayed by rational argument, there are countless others more affected by non-rational psychological factors….Intense, often unconscious psychological barriers to belief in God are of great importance….Psychological factors can be impediments to belief, and these may often be unconscious factors. The extent that these factors are present in the lives of people, as well as the their individual temperament, upbringing, and social environment, may make belief in God much harder than for those who have not suffered these same factors. b. In spite of serious difficulties to belief, all of us have a free choice to accept or reject God. Although the ultimate issue is one of the will…it is still possible to investigate those psychological factors that predispose one to unbelief, and that make the road to faith in God especially long and difficult. His main points are that many people are atheists for the following reasons (including himself before he converted at age 38). My reasons for becoming and remaining an atheist skeptic from ages 18 to 38 were superficial, irrational, and largely without serious intellectual or moral justification. I am further convinced that my shallow motives were and still are commonplace among skeptics. General Socialization – the desire to fit in with peers in the secular culture, in which traditionalism and faith are considered backwards. Simple Personal Convenience – “The fact is, it is quite inconvenient to be a serious believer in today’s neo-pagan world. I would have had to give up many pleasures and a great deal of time….Now perhaps you think that such perspectives are restricted to callow young men like myself, but it is not.” He goes on to quote from Mortimer Adler. He admits that, though the simple reasons may be the most common, there are deeper psychological reasons why one might be an atheist. First, Freud characterized belief as illusions that are fulfillment of the deep wishes of mankind to be safe from the difficulties of life, and theorized that we all have a desire for a benevolent father. However, after deconstructing this view as not central to Freudianism (as Freud himself admitted, it was not an extension of his analytic theories, but just his personal views), Vitz argues that Freud’s ideas also provide a basis for evaluating unbelief. I believe Freud is quite right that a belief can be an illusion that arises from powerful wishes, from unconscious childhood needs. The irony is that Freud himself provides a powerful new way to understand the neurotic basis for unbelief. He goes on to discuss the Oedipus complex that forms the center of Freud’s theory of male emotional development. Briefly, the boy is threatened by his father, and has an unconscious desire to kill him, but since he cannot, he eventually instead identifies with him and the fear and hate are sublimated and never removed, and they may surface later as neuroses and our innate hatred for authority. If we take this as true, we can see the wish-fulfilling desire to reject God, who represents the ultimate powerful father, and so we have a deep rebellion against such authority, and a desire to replace Him with ourself. Voltaire, though a type of deist, rejected his father to the point of changing his name, and displayed an overt hostility to the King and religion. His first play? Oedipus. Vitz goes on to say that no other theory of atheism has been deeply developed, but another idea of Freud’s which he did not explore provides a more detailed model for the formation of atheism, and he uses this for his own theory, since Vitz believes that the Oedipal complex is really not the best or broadest model. Psychoanalysis, which has taught us the intimate connection between the father complex and belief in God has shown us that the personal God is logically nothing but an exalted father, and daily demonstrates to us how youthful persons lose their religious blief as soon as the authority of the father breaks down. Once a child or youth is dissapointed in or loses respect for their earthly father, then belief in a heavenly Father becomes difficult or impossible. Freud – His own father was a weak man, unable to provide for his family, and passive in response to antisemitism against the family. Freud’s own writings show his disappointment with his father. In two of this letters as an adult, Freud writes that his father was a sexual pervert, and that his own family suffered because of it. Additionally, his father spent hours reading the bible with Sigmund, which connected this weak figure with God in Sigmund’s mind. Ludwig Andreas Feuerbach – When he was thirteen, his father left the family and openly took up living with another married woman in a different town. In the early 1800’s in Germany, this would have been a deep and public scandal. When his mistress died, he returned to his original wife as if nothing happened. Additionally, the father, a well known Jurist, was described as “the Volcano” because of his explosive, angry temperament. Madalyn Murray O’Hair – She hated her father so much that she tried to kill him with a Butcher knife. Albert Ellis – Vitz tells a very funny story about how he actually read his thesis to this established atheist psychologist and theorist, who denied that it applied to him, but whose biography actually mentioned that Ellis’ father abandoned the family when Ellis was 10, and was largely absent before that, due to an illness. The mother had a mental illness, so Ellis grew up on the street essentially without his parents. Schopenhauer – disliked his mother a great deal and liked his father, but his father committed suicide when Schopenhauer was 16. However prevalent the superficial motives are for being an unbeliever, there still remain, in many instances, the deep and disturbing psychological sources as well. However easy it may be to state the hypothesis of the defective father, we must not forget the difficulty, the pain and the complexity that lie behind each individual case. And for those whose atheism has been conditioned by a father who died, who rejected, who denied, who hated, who manipulated, or who physically or sexually abused them, there must be understanding and compassion. Certainly, for a child to be forced in this way to hate his father or even to despair because of his father’s weakness is a great tradgedy. After all, the child only wants to love his father, and to have a father who loves him back. For any unbeliever whose atheism is grounded in such experiences, the believer blessed by God’s love should pray [for them]…perhaps the former atheist will expeirence even more joy than the beleiver, for the atheist will have that extra increment that comes from his surprise at finding himself surrounded by joy, in of all places, his Father’s house. Now that is a compassionate man. You can hear the whole thing here, and you can also see his book – Faith of the Fatherless: The Psychology of Atheism. Pure speculation, of course. And rather funny. It’s interesting how, in the modern world, acceptance of the voodoo arts of psychology is so widespread that even christianists have adopted it to attack their enemies. Maybe their unresolved resentment and hostility has led them to project their own neuroses on their tormentors. You do realize that not all religions have a strong father figure? Seeing a common thread of antipathy toward a father, is a common sense approach to seek truth and reality. Perhaps what is needed is a large study of both atheists and believers to seek a larger piece of reality. I do not see anything threatening to believers or nonbelievers. Also, common logic dictates that Freud's method be used in both ways to test the validity of his psychological theory.